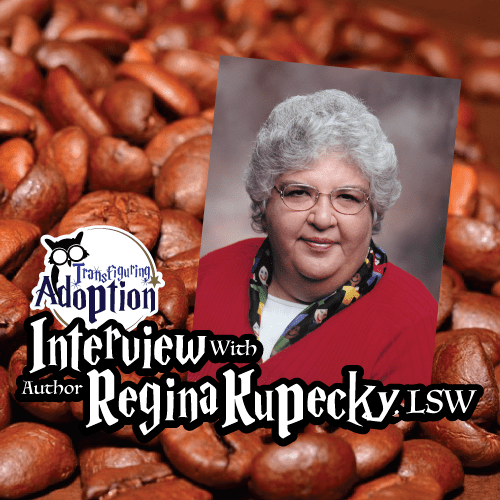 I had the great privilege of speaking with Regina Kupecky, an experienced therapist in the field of foster care and adoption and author of several books for children and adults. Hear about her experiences, books and resources, motivations, thoughts on the child welfare system, and advice for foster and adoptive parents. Listen to our conversation above or read the transcript below. Margie: This is Margie Fink with Transfiguring Adoption. Transfiguring Adoption creates media and resources to help nurture and grow foster and adoptive families. 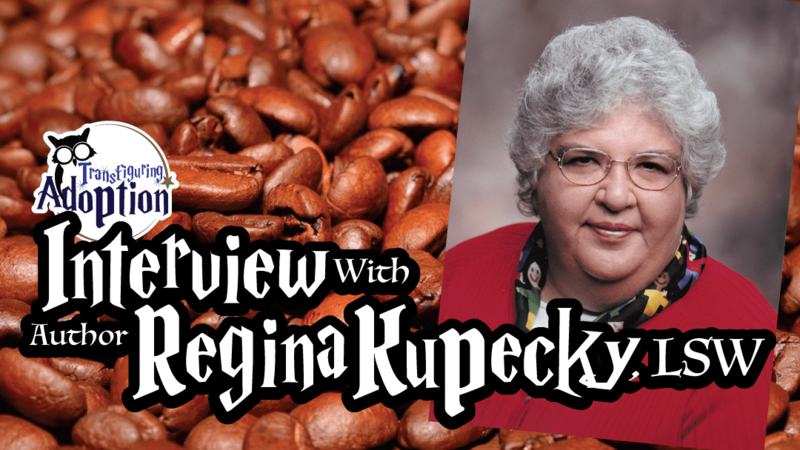 Today I have the privilege of speaking with Regina Kupecky. Regina is a licensed social worker, author, and trainer who’s worked in the field of adoption for over 35 years. Thank you for joining us today, Regina. Regina: Thank you for inviting me. Margie: I first became familiar with your work when we were on a family vacation, and we were just getting ready to hit the road to go home. We stopped at an outlet mall, and I found this book called Adopting the Hurt Child. I thought this looks really interesting and I picked it up, and I tell you what—we had about a five and a half hour drive home that day, and we were probably halfway through it when I had just soaked through that book. I had dog-eared pages, just kind of soaking in all the wisdom in that book. I learned so much that really just changed the way I was parenting our own hurt children. But tell us a bit about your experience first, and then we’ll talk about some of your print resources. Regina: Okay, I started working in adoption placing infants for Catholic Charities back in the old days when we were down to like 60 babies or something a year when when you were two years old you were too old to be adopted. And then I worked for Northeast Ohio Adoption Services, which is a private agency that places public agency children and kinda Kelly girls we used to call ourselves. You need more help, and we will come in and help you. And then I heard people speak about attachment and issues and how kids act, how you should parent, etc., and like a giant light bulb went off in my head, and I said so this is like every kid I work with. Then I met Dr. Keck, and I started working part-time for him, and then I switched to working full-time for him, and we wrote Adopting the Hurt Child together and Parenting the Hurt Child. And then I wrote a six book series of workbooks later. Margie: So tell us a little bit about the two books you wrote with Doctor Keck, what your motivations were and a bit about what parents can find in those books. Regina: Well, I think our chief motivation was to educate parents. We really wrote it so that parents would enjoy it. It’s not real technical with 5,000 footnotes or anything, because we just felt so many people were floundering, and they couldn’t find people who understood the problem because people with a therapist who doesn’t understand adoption and attachment, most of what they do doesn’t help. It’s not the therapist’s fault, like if you’re going to the best cardiologist, but you have diabetes. And so we thought, well we can’t see everybody in the world, so maybe we could at least, you know, explain what’s going on. Then we thought with Adopting the Hurt Child it was very self-explanatory and now life is good. Then all these parents said, “Ok, now what do we do? We don’t get it. We understand the theory, but we don’t understand the practice,” and that’s when we wrote Parenting the Hurt Child with more ideas and why traditional parenting doesn’t work and some things you can do that might work …and how to get some of the anger out of your family and how to nurture more because nurturing’s what’s going to cure the problem. Punishment’s not what’s going to cure the problem. Margie: Yeah, that’s one of the things I loved about—and I’ve later read Parenting the Hurt Child as well—one of things I loved about Adopting the Hurt Child was just kind of the breakdown of what some of the behaviors are that you know that seem abnormal to parents but are really like we in our house call abnormally normal. It’s normal for the kid’s situation and their experiences ,but you know you guys really explained what causes those behaviors, why they come about in ways that were really enlightening and really made a lot of sense, and that was one of the things that really impacted me because we were fairly early in our journey and some of the just obvious lying and some of the stealing and some of the lack of cause and effect thinking…you and Dr. Keck explained that really well. Regina: Right, they don’t have it, so quit being mad at them. Regina: It’s hard because we live in a culture that really doesn’t recognize mental health issues as real I think. If you adopted a child who was blind, nobody would expect if you love them a lot, they would suddenly see. But you adopt a child with mental health issues, and people think that if you just love them, they will just suddenly not have mental health issues. Margie: Right! And these kids… you know we’ve got four beautiful children, and I had a school psychologist just a couple months ago ask me, “Yeah, but how does PTSD effect him in the classroom?” You know, they’re looking at these children, and they see you know the effects of trauma really look like defiance or attention deficit disorder or you know something else, and that’s how they treat them and that’s not the way they need to be treated. So your work is really, really important. Tell us a bit about the different workbooks you have. Regina: And I think a lot of parents do that. Sometimes when I’m giving talks, you know I’ll say something about say the orphanage in Russia and somebody will say, “Yeah, but well my child came from Bulgaria so it’s different.” Well, it may be, not really. It’s still an institution. Margie: Right, and while every institution is different, still, the effects of institutionalization are pretty general. Regina: Right. Right, good institutions are better than bad institutions, but the good institutions aren’t good. And the workbooks again…I sort of thought I hear from so many parents who just don’t have any resources. There’s nobody around that understand the kid’s issues. There’s nobody. They feel pretty out there and alone. So I thought, maybe this will help open up some doors and let the kids talk about the birth parents or siblings or some of the other issues that we cover in the books. Margie: Yeah, absolutely! That’s kind of what our website is all about is getting parents the resources so they can help nurture the kids, help them grow, help them heal and bond and connect. So these sound like absolutely…I have not seen those workbooks. I just read about them for the first time the other day, and they sound fabulous and just something that a lot of the parents that look at our site would really appreciate. So where can parents find those workbooks? Margie: We will get them all linked up when we publish the blog, and we’ll also get them on our book list, so that parent scan get to those. Also my husband and I listened to your webinar recently that was hosted by Adoptive Families and again we just we love how down-to-earth you are and some of the things that you talked about bringing humor and just really speak to us and it’s a lot the way we try to parents so do you do speaking engagements around the country? Do you, you know just generally do webinars and stick around Ohio? Regina: I’m gonna be in Buffalo and in Albany this summer. I’m not very good at running around promoting myself so if somebody calls me, and we can do it, I do it, but I don’t really like to pursue it. I’m still working…the Attachment and Bonding Center of Ohio closed last year. Dr. Keck passed away unexpectedly 15 months ago, but we opened a new office—The Adoption and Attachment Therapy Partners—which we kind of laugh…same people, new furniture. So I still am seeing clients. In Ohio we’re really lucky if any of you listeners are in Ohio. There is post-adoption money available to pay for therapy. you in Ohio there, what services are available? Regina: We have a parent support group, and we do neuro-feedback. I don’t because I never got trained. That is very helpful with a lot of the kids, and we also can offer a EEG which gets read by a medical doctor which actually looks at the brain of the child to see what’s going on in there and what connections we can build on. And we do post-adoption therapy. Margie: Gotcha. Do you do kind of individual or whole family or ? Regina: The whole family’s involved. The parents ninety percent of the time are in the room with the kid because we’re trying to build attachment between the parents and the child, so if the child’s to be upset or angry, the parents need to be there. And we work with the parents a lot, like if we think the parents are doing something that is not helpful, we’re not going to discuss that in front of the child because it just gives the child too much power. Yeah, but you know it’s hard because parents often come in very angry and confused. Sometimes it sounds like we’re saying just let the child do whatever they want, which is not what we’re saying, but I think when parents are so angry, it really makes attachment impossible because who wants to attach to an angry parent, even though the child is making you angry. It’s their defense because they are scared. It’s very confusing. It’s the opposite of practically every kind of parenting there is. Margie: Do you do any work with the parents as far as you know, I’ve seen in my own life, you know once you start parenting these kids, some of your own attachment issues and your own past trauma really gets brought up, and it starts to trigger your own issues. Do you do any work with the parents to help them work through..? therapy is helpful, and they go to wherever they want to go. Some of the parents have started doing neurofeedback also on themselves. I mean, obviously, you don’t just do it on yourself. You find a therapist. They found that it’s really helpful for them as well. Yeah, because a lot of the kids just trigger things that happened to the parents in their childhood. Margie: So you have a curriculum My Brother, My Sister: Sibling Relationships in Adoption & Foster Care and then you resource pamphlet “Siblings Are Family, Too.” We actually, in our home, this is a huge thing for us because we have bio siblings who are separated from our kiddos, you know, and that impacts them daily. What do you see in your practice as far as the impacts on kiddos? Regina: Well one thing I was kind of surprised when I wrote that curriculum, I was at some conference—I can’t even remember what it was—and it was still rough. I mean my film and stuff was still rough, and I asked a few people if they could look at it with me, you know just to give their opinions. They were therapists and social workers. So we’re sitting in this room watching this, and then there was dead silence, and I said I’m thinking, “Is it really that bad?” And they all said it never occurred to them that there were sibling issues…that if a parent brought in a single child…they adopted little Johnny, they assumed little Johnny was an only child. So, they never talked about NEVER talked about their siblings that they were separated from…nothing, and i was just blown away cuz I think it’s 85% of the children who were adopted have siblings. And it’s not just, you know, every sibling can be with every sibling for lot of reasons and that’s in the curriculum. I wrote the curriculum to try and encourage agencies to educate parents about sibling issues and what they could do and how that sometimes triggers things, like you might not know it’s their sibling’s birthday, and that might just make them very angry or very sad. It depends on the child. Sometimes children when they’re sad they act out, and they punch holes in the walls. Some act in and do things like cut… But to acknowledge their siblings, to talk about them, just little things like that. So it’s really a curriculum. I mean it’s got a DVD and PowerPoint and handouts and a trainer manual. The resource guide “Siblings Are Family, Too” is from Three Rivers Adoption. Margie: So, the curriculum is more towards agencies, correct, and workers? Margie: And then “Siblings Are Family Too” is that..
Regina: It’s just like a little 25-page pamphlet. Margie: Who’s the target for that one? Margie: Okay, very cool. If you could tell foster parents one thing, what would that be? Regina: Stop being angry…that they can do a lot of damage when they ask for a child’s removal because I think when when kids keep getting removed, that’s just what they’re going to do. They’re going to go into an adoptive home and act the same way to see because they can’t believe that anyone is going to keep them because no one’s kept them. We’ve seen kids who’ve been in 15…25 homes. Margie: Yeah, what would you tell a parent that believes there’s no hope for their child or family? school, to me that’s like somebody else getting a Ph.D. Like how in the world do they get up and do that? And I think you have to become educated. There is a new book out. I don’t know if you’ve read it. It’s called The Girl Behind the Door. Margie: I’ve not heard of that one. Margie: Oh, I think I did hear of that..
Regina: …very young. It’s an excellent book. He goes to a bunch of professionals. Someone mentions adoption and attachment but then gives him some neurophysical he can’t understand or something and at the end it’s kind of sad, he said all the answers were a Google search away. I just didn’t know. And I think a lot of people just get stuck in their, “I’m not going to change. The child’s going to change. I don’t want to parent that way. I’m not going to parent them differently than I parent my birth children. I don’t wanna do that,” and a child doesn’t even have any hope if you’re not going to learn about the disorder and figure out how to parent differently. It’s that mental health, physical health thing. If I gave you a child who has leukemia, you wouldn’t say, “I refuse to learn about leukemia and how I’m supposed to care for him, and yes, I will care for him differently than I care for my birth children because he’s got leukemia, and he needs help.” I don’t even know how some of these kids breathe. If all of this stuff happened to me, I think I’d be in a cave. Margie: What’s encouraged you about foster care and adoption over the years, like changes that you’ve seen? [Regina] “What are you talking about? You can have attachment disorder before you’re three.” So that’s kind of discouraging. I was going to say, in terms of education, when I first started working with kids from foster care, our agency we made up our own curriculum, and parents would say, “I can go to other agencies and not have to come to education,” and our director was, “Fine, if that’s what you want to do, go ahead.” Now I think agencies try to educate people, and I think it’s just like, I don’t think they’d necessarily do a bad job, like you mentioned… like I had this gay couple and in Ohio at that time, you couldn’t get married, so one person adopted, and the other person coparented. And they kept saying, “The agency never told. The agency never told us.” But the other coparent person decided to adopt and went back to the classes, and she came home going, “They did tell us. Look at this handout. Here’s the attachment cycle. They did tell us. We weren’t listening because we didn’t get it.” We should open up the preservice to post adoption and say if you want to go over sexual abuse again, come on back. I mean it doesn’t cost anything. But we kind of dump people, like “Congratulations! Goodbye!” And I think there’s a big need for more post-adoption services. Margie: We will make sure to link up all of the Amazon [resources]. The pamphlet and those resources, are those available on Amazon as well, or do you need to go to Three Rivers Adoption? Margie: That’s all the questions I had. Is there anything that you would like to add…anything I didn’t ask that I should have asked? Regina: Well I think another important component is to try to find some support. If there’s not a support group, just find one other family that maybe you can trade kids once in awhile. I know respite’s often a big problem. People need it, but it’s not really available. Even if you have the money, sometimes you can’t find anybody. Think outside the box, like none of us were adopted, but there were five of us, and my grandfather lived with us, and every once in a while my parents would say they were cleaning the garage on Saturday. We all disappeared because we didn’t want to help. Then we come to find out years later that they actually went into the garage with a thermos of coffee and some like donuts or something and sat and talked to each other in the car. And they knew we wouldn’t bother them because then we would have to help. My mother asked, “Didn’t you ever notice the garage never got cleaned?” and I said, “No, I never noticed.” So, it’s not like a cruise through the Caribbean, but maybe you could get fifteen minutes to drink a cup of coffee. I mean you just have to figure, and it’s hard to think when you’re so exhausted and so overwhelmed and that’s why I think a buddy family or a support group can really help. Our support group, a lot of the moms do respite for each other. They know I’ll take your kid one weekend, you’ll take mine one weekend. And then we have a mom who adopted, and her youngest is already in college, so she knows what the kids, what their issues are and stuff. She’ll do respite, and if you can pay her, she’ll take the money, and if you can’t pay her, she’ll doesn’t charge you. You have to reach out, and that’s very hard. A lot of our parents isolated, and they’re so embarrassed about how their kids act, and they can’t go to church because their kids act out, and they take them to a restaurant, and they can’t do that. And they just become so isolated, which is not good for family, or themselves, or it’s not good for anyone. Margie: Well, I want to respect your time, but I really appreciate you taking the time to speak with me. Regina: Have a wonderful Easter. Margie: You, too. Thanks again. Transfiguring Adoption believes that books and other media are an excellent way for not only children but anyone to work through trauma and past issues. There is simply something therapeutic about getting away from your own real troubles but seeing them play out on a fictional character. Families, children, and adoptees have often told us at events that Transfiguring Adoption’s discussion guide helps folks because people can relate to Harry Potter or another character in the book. It is then easier to talk about a character’s issues rather than dwell on your own. The Harry Potter Alliance is an organization that seeks to turn fans into heroes. They help resource their local chapters throughout the world and spread information so that everyday fans like you and me can not just wish to help but actually begin to solve the world’s problems. There are so many times as a foster or adoptive parent that you may be focused on solving the issues caused by past trauma in your kiddo’s life that the family unit neglects to think about how they can help other folks in the world. Again, we believe there is power in the useful tool of books. This project has the chance of not only positively affecting the lives of children in the States but keep reading to see how you can make a HUGE impact in the lives of children just receiving the resource of a library. “Since 2009, this annual worldwide book drive has given over 250,000 books away to communities in need. This year, we’re [HPA] doing something special. In 2015, our Masaka HPA chapter worked with leaders and volunteers in their community to build Good Shepherd School, a co-educational school for 250 young people in Masaka’s rural area. 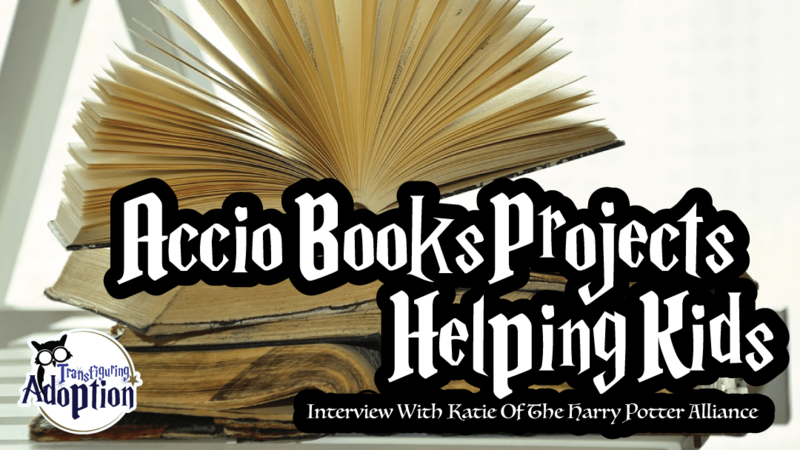 This year, they plan to open a library – and we’re [HPA] going to stock it. That’s right! Wizard Activists will send thousands of books and school supplies to the school in order to stock its brand new library. We’ll also be working with three awesome organizations – Books for Africa, the Literate Earth Project, and Out of Print Clothing – to maximize our impact and make sure that Good Shepherd gets a great mix of fiction, nonfiction and academic resources! What the general public and new foster or adoptive parents might not realize is that many children who will enter their care have lost their voice. What do we mean by that?! Children who have come into the care of a foster or adoptive parent have commonly not had their needs, requests and wants heard by adults in the past. These are the babies who cry without getting a bottle or diaper change. The kids who scream for an abuser to stop but no one rescues them. Essentially, the children who have been ignored and NOT used to being in the company of a safe and attentive adult. Children who are in a situation like those above more than likely do not know how to express themselves properly or “normally” in healthy relationships. Why would they?! They haven’t been trained or given situations to practice healthy attachments. It is imperative then that children be given a variety of ways in which to express themselves in a healthy manner. Nate Heck. An Art Teacher To The Rescue. While searching for a way to help teach my children learn about art techniques for home school, I (Darren) came across a YouTube show teaching about the artist Seurat and pointillism. The show, Artrageous With Nate, immediately captures the attention of my children. The show was founded and is hosted by Nate Heck. Nate has taught art and multimedia in several different capacities and various ages. He even educates educators. While this Master’s level teacher is passionate about the arts, he is also adept and very interested in how history, science and math intersect the art world. In fact during my interview with Heck his eyes appeared to beam with joy at the idea of walking into a high school where the art instructor was using his program while instantaneously the science teacher down the hall would be using the same episode. However, before we go any further, let’s get an overview of Artrageous with Nate. Artrageous With Nate. It’s All About Process, Creativity and Fun. Artrageous With Nate is a television program that is on PBS Digital. The shows are targeted toward kids 12 to 16 years old. However, my children who were ages 5 – 11 were equally engaged with Nate during his shows. Artrageous began with full-length episodes that were close to 30 minutes in length. However, in discovering that educators longed for shorter snippets to utilize in classrooms the episodes have become shorter but still packed full of quality. Upon viewing the Artragous program I would describe it as having four major category ingredients that are beautifully intertwined into one great show. Each episode revolves around an artist. Kids are given historical facts and stories about the artist. This may seem like the easy section of the show. However, I learned from my interview that Nate really wants to show kids how the artist was a real person just like them. Thus, Heck sets out to find out fun facts about the artist – for example he attempted to find out if Jackson Pollock had a dog and the name of the dog. He also takes the viewer through Pollock’s home to better show the artist’s life. Just like many popular kids’ science shows like Bill Nye, Artrageous finds an interesting way to engage kids about a way that our world or their body works. For example Heck teaches students on how the eye works so that pointillism dots appear to be an image rather than merely dots. As Heck told me during the interview, he strives to find a way to introduce students to a stunt that has you saying in your head, “Can they really do that?” During the Pollock episode kids zip line high about a canvas as they spray paint from super soaker type water guns to create a large spattered image just like the artist. During every episode Nate gives the audience an assignment that relates to the artist or theme taught about during the show. This is the BIG part of the show for your child because this is where they put their creativity into play. As the parent you will be very happy and interested to know that Heck works out of his basement office. Why?! During our interview he voiced his understanding about the expensive nature of art supplies. When he considers projects for an Artrageous episode, he looks around his basement and considers supplies that families will already have at home. Many would agree that children who are adopted or fostered could always use new skills or ways to express themselves and communicate with others. The arts are also obviously very therapeutic for anyone. 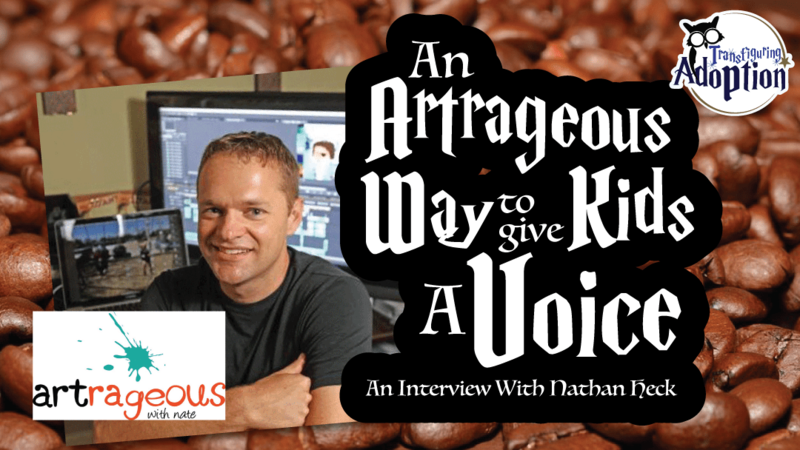 However – why is Artrageous With Nate a great resource for your family? It was reinforced during the interview that Artrageous With Nate gives your child a sense of accomplishment and success while learning how to be creative. Creativity, after all, is something that all of us must be as successful adults. Whether it’s figuring out how to juggle your daily schedule, putting together a work presentation or a myriad of other daily tasks at home or in the office, there are a number of times that thinking outside of the box greatly aids us in our day. Thus, as I spoke with Nate I learned from him that creativity isn’t just for artists. Heck even mentioned in our interview that when he speaks at a school assembly he will tell the kids that he is not there to speak to them about becoming artists. It’s about learning how to think creatively. Finally, the show allows kids to engage in something that they can’t fail at. Parents have asked Heck why he doesn’t present finished projects at the end of each program. Nate explained to me that as soon as he presents his own work children immediately have the expectation in their mind that they must mimic his level of artistic skill or else they have failed. Again, Heck wants your child to practice and learn the art of being creative. Consequently, as Fred Rogers is a huge influence on Nate, he actually welcomes kids to send him their artwork. Nate explained to me that he takes time to look at every picture, drawing and project just as Fred Rogers would answer letters every morning from children. Watch Episodes. Support the Show. put that passion to work in classroom settings. a Master’s in Educational Technology from Indiana University.